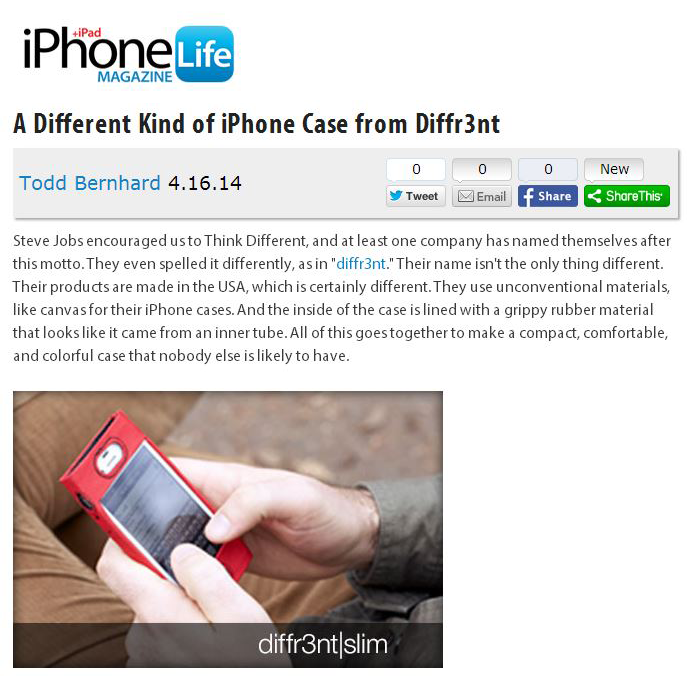 Congratulations to our ClientÂ diffr3nt for their feature on iPhone Life Magazine! Finally, the case youâ€™ve been wanting – compact, comfortable, colorful and made in America! The structure of each diffr3nt case is designed to withstand the daily bump and grind. Made with canvas, the case protects your phone from drops, scrapes and resists moisture. Itâ€™s the same material thatâ€™s used to protect boats, ATVs and snowmobiles from harsh elements. Inside, the back is lined with SlipNotÂ® technology to hold your phone in place and add extra shock absorption. Be Better. Be diffr3nt. Check them out atÂ diffr3nt.com.